Shropshire have signed ex-Derbyshire and Yorkshire slow left-arm spinner David Wainwright in a bid to boost next summer's Minor Counties title hopes. 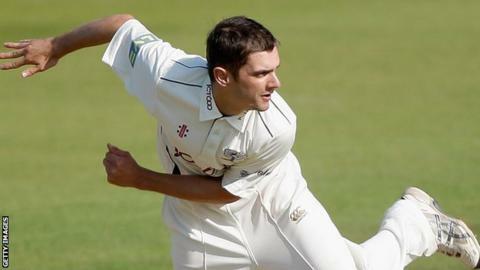 The 30-year-old Yorkshireman left Derbyshire in August by mutual consent, after being released from the final year of his four-year contract. He will be reunited with Shropshire director of cricket Karl Krikken, who was formerly his coach with Derbyshire. "Karl took me to Derby. I've enjoyed working with him before," he said. "After I left Derby he was the first person to get in touch so, after I spoke to him, it was a bit of a no-brainer to sign for Shropshire." Wainwright's arrival will help bolster Shropshire's attack following the departure of fellow former Yorkshire spinner Gurman Randhawa to Durham and seamer Ben Sanderson's proposed move to Northants, for whom he played three Championship matches last season. Shropshire, now under the captaincy of Steve Leach, brother of Worcestershire vice-captain Joe, finished third in the Minor Counties Championship Western Division last season. David Wainwright enjoyed the most successful season of his career under Krikken in 2012 when he took 44 County Championship wickets at 31.36 to help the county win promotion as Second Division champions. He has so far taken 179 first-class wickets in 80 matches, and also made three centuries. Wainwright began his career with Yorkshire, during which time he made three appearances for England Lions.